First off- I have to apologize for how late our Thursday post is going up! I’ll save the details for another time and after everything is worked out but I was in my first fender bender tonight. I take a lot of pride in being a responsible driver and my excellent driving record to match it. Tonight, a woman who was heavily distracted, driving a little fast in a parking lot at a public park, and talking on her cellphone did not see me reversing out of my parking spot. I was literally all the way out of the spot – since the middle of the back bumper is where we hit. However, since I was the one backing out of the parking space I understand I am probably at fault. I am just really upset because I truly believe that if she was paying attention she could have A) beeped at me or B) let me finish the process. But that is why they are called accidents and I truly believe there isn’t anything I could have done differently. I hope the next step is an painless as possible though! Onto the food! This week is quinoa cakes! This recipe comes from Sally’s Baking Addiction and it was a huge hit in my household. They are quick, easy, and delicious! 1/2 cup finely chopped carrot and zucchini (1/4 cup each veggie) **I used 1/2c of each! Combine the quinoa, eggs, salt, and lemon pepper in a large bowl. Stir in the parsley, onion, cheese, and garlic. Stir in the bread crumbs and chopped carrot/zucchini. Let the mixture sit for a few minutes so the crumbs absorb some of the moisture. At this point, you should have a mixture you can easily form into 20 thick patties. You want the mixture moist, so the patties aren’t dry tasting. However, you want the mixture to hold together when cooking. You can add more bread crumbs to firm up the mixture, if needed. Alternatively, you can add a couple drops of water to moisten the mixture. *The uncooked quinoa mixture keeps nicely in the refrigerator for a few days. Cover tightly and cook the patties when you have time. Heat the oil in a large skillet over medium-low heat, add 5-6 patties, cover, and cook for 7 to 10 minutes until the bottoms are deeply browned. Carefully flip the patties with a spatula and cook the second sides for 5 minutes, or until golden. Remove from the skillet and cool on a large plate while you cook the remaining patties. Add more oil to the skillet if needed between each batch. Serve plain or in a pita, on a salad, on a sandwich, with sliced avocado, with hot sauce on top, etc etc. There are so many ways to enjoy them! Make ahead tip: Cooked quinoa patties keep well in the refrigerator for 1 week or in the freezer for two months. A quick few seconds in the microwave will warm them back up to enjoy. Let us know if you try the recipe and check out Sally’s Baking Addiction for other great recipes as well. The treadmill can be our best friend for walking or running- especially when the weather is not cooperating! We love using the treadmill to add hills into our workouts. Especially because some parts of Long Island are sooo flat. Pam always jokes her biggest hill is the boardwalk ramp. Running hills requires you to work harder and recruit different muscles than running on flat ground. The inclines also forces a runner to expend more energy. Changing your workouts from a flat surface to a hill will help to strengthen the glutes, quads, and calves. Besides an increase in caloric expenditure, targeting these muscles can help to improve stability and running performance. When working with the incline on a treadmill, it is important that we focus on our form! There is a change in the way we walk or run in order to efficiently carry ourselves up that incline. Lean into the hill. Focus your energy forward and up the incline. Shifting your weight from the heel instead of bending at the waist will create an efficient movement. Walk/Run naturally. Swing your arms by your side to help keep your legs powering up that hill. Think short, quick steps and your arms will match that cadence. Holding on for balance. For our walking friends out there, it’s okay to hold on to the handrails for balance. Try to avoid a “death grip” though! Holding on lightly will give you that secure feeling without altering your gait. For this workout, maintain a comfortable walking or running speed. We are going to be changing the incline for an awesome hill interval workout! Following the timing listed below then switch to the next incline to climb all the way to the top! Every week I’m going to recap my workouts and training in a single post on Sundays. That way, if you are interested in my fitness journey, you can read it! If you are here more for the recipes and fitness facts, you can skip it! Obviously today is actually Monday and not Sunday, but that’s because yesterday I had a to do list a mile long and I wanted to get as many things completed as possible but it just wasn’t possible to finish it all. My current fitness goals: enter marathon training as strong as possible, complete a pull up unassisted, and learn how to swim. I know some basic life skills in the water, if I was to fall off a boat I could survive for a little while, but I want to become an efficient swimmer and build confidence in the water. Wait no longer! My week went like this! Monday: 3 mile progression run – in the rain. Friday night I parked my car in the west end for happy hour and left it there as a responsible adult. However, it was now Monday morning and my car was still sitting in the west end. Oops. So I had an obligatory run to get it and it was raining. The result: 3 miles in 24:33 for an 8:11 pace with a progression in splits of 8:23, 8:16, and 7:52. Tuesday: I lifted my upper body before work (aka 5am workout) with a focus on my back muscles. I will do pull ups by summer, I will do pull ups by summer, I will do pull ups by summer. After work I ran an easy 3 miles WITHOUT my Garmin. These runs are essential to training in order to let go of the numbers and really just listen to your body. Wednesday: On Wednesdays I work a split shift so I have a 3 hours gap in the middle of my day so I head to the gym. Today I had a tempo run for 40 minutes. I did a 10 minute warm up and followed that up with 4 minutes fast and 4 minutes recovery 3 times and then a cool down to wrap up. Normally, I would do this in regards to distance but I like the Woodway treadmills at the gym whose MPH just seem wrong. I followed this up with a quick but effective lower body routine that focused on single leg strength. Friday: I got off of work in time to head to a SoulCycle class with one of my favorite instructors. If you aren’t familiar, keep your eye out because next week I am doing a post on SoulCycle and why I love it as part of training regimen. I then headed to a Vinyasa Yoga class at my gym in which I am enjoying more and more. Saturday: REST DAYYYYY! I still struggle with the mental part of a full rest day but I know that it is essential for my body. I considered counting a few intense rounds of Just Dance with the niece and nephew as a brief HIIT workout. Sunday: Long Run Sunday Runday. I had 8 miles on the agenda and I procrastinated until late in the day. I really didn’t want to go but I told myself to just put on your shoes and GO! I ended up having a fantastic run of consistent miles for 8 miles in 1:10:14 for a 8:46 pace. I gave myself two thumbs up for that training run. So there you have it- my week in summary. Today I started training again with my running coach Jess (www.racepacewellness.com). The New York City Marathon is 7 months away and I’m excited about the journey over these next 7 months. How often do we find ourselves looking for excuses? I was tired. I definitely had a migraine. Um hellooo, it’s raining. But there were men installing things in my apartment so I decided to go and beat the rain. Something changed inside my head while I was running today. My run was definitely slow and far from the progression run I set out to do. As I ran, I thought, the people in these cars must think I am crazy. By mile 4, it was pouring. I kept going, seeking shelter under a train trestle to eat my Gu, stretch my legs, and check my Garmin. Woof. That pace. Thoughts on My Long Run: Three people inspired me to keep going. 1. Earlier this week, a client of mine took one of my group fitness classes. It was a tough class, but everyone in that class kept up and worked hard through an amazing workout. Later that day on social media, she and a friend are sporting stickers that said, “I tried.” They’re laughing and talking about my challenging group fitness class. This came to mind as I glanced at my watch with each passing mile. I tried. I was soaked, I didn’t run my fastest, but I went. 2. This brings me to my professor. At SRU, I was a member of Run Club which was a group of exercise science students and professors who met up on Tuesdays and ran a 3 mile loop. Before we took off, one of our professors would bring us all together and talk business. Without fail, before we left, he’d always say, “let’s went.” Think about it. It’s one thing to talk about having a run or a workout to do, but it’s another to have accomplished that task or met a goal. I went on my long run. 3. This guy came out of nowhere and passed me! Maybe my music was louder than I thought. He apologized to me, but startled, I replied, “I thought I was the only one crazy enough to be out here!” He stayed in my sight for quite a while, as we were heading in the same direction. With about 2 miles left in my run, I decided to catch him. He was probably running just above my race pace and I needed a strong finish anyway. Then I caught him! Okay, fine, he got stuck at a traffic light, but I wasn’t far behind. Naturally, I made a new friend because he asked me what I was training for (he is running the Long Island Half). That’s when all these thoughts clicked. Of course I’m training for a race; it’s raining and I’m outside running. I am trying to break my PR in Brooklyn so I went for my long run today. I’m a runner. The Word of Mouth event was inspired by gossip; in this case, the good gossip. Last month, lululemon Roosevelt Field hosted their first Word of Mouth event at Lifetime Fitness in Garden City. Store ambassador, Regina Smith, shared her story with a small group. Last night, we adventured to Wantagh for lululemon’s second event where Kaley Young shared her story. For those of you who don’t know Kaley, she is the owner of Hot Pilates Secret in Wantagh. Her mother built HPS and created a class that not only works up a sweat, but inspires you to dig a little deeper. “Think of three things you are grateful for just for today.” After her mom passed away from breast cancer, Kaley became dedicated to sharing the love and kindness her mom had created. L: Thoughtful. Sincere. Inspiring. Motivated. These are words that come to mind when I think of Kaley. I got to know Kaley from the time when I worked at lululemon in the Roosevelt Field Mall. I’ve taken her pilates classes, learned to do a headstand, and had margaritas and pizza in her backyard; but last night I was able to listen to her full story. She’s that good. P: Emotional and empowered are two words to summarize the evening for me. It was such a special evening as Kaley took us on her journey and how she has overcome so many obstacles in her lifetime with the power of love. A couple years ago I was able to take a couple of classes at HPS. From the moment you walk in the door, you can immediately sense there is something magical happening in that studio. Kaley and the employees of lululemon pulled off an amazing event! Kaley’s backyard was set up with blankets, heat lamps (it was kinda chilly last night), a s’mores bar, and a projector to share some memories. Oh! and wine 🙂 We chatted a bit before the event started, then everyone gathered around, campfire style, to hear Kaley talk. She spoke about her parents’ true love, growing up and learning lessons, her mother’s fight against breast cancer, the growth of Hot Pilates Secret, and her own dreams and goals. We laughed, cried, and listened intently. Kaley’s story inspires you to become a more confident person, remind the people around you that you love them, and to truly believe in yourself. After she had finished sharing, we had a social hour! There were lululemon employees, their friends, Kaley’s family, HPS lovers… it all spread by word of mouth. Joined by our friend, Chelsea, we totally hit up the s’mores bar. Hot and toasty marshmallows? Yes, please! Can’t wait to find out who will be sharing their story next?! We’ll be sure to spread the word… Subscribe to our blog! Sweat happens, and when we workout we sweat. Some of us hop off the stairmill dripping, some of us barely break a sweat on the bike, and some people sweat standing in the squat rack. Everybody is different when it comes to their workout, hydration, and to their sweat rate. Recently, I’ve had a lot of clients and class participants comment on how they are trying to sweat more during their workouts. That’s great! Putting in hard work and trying to increase your effort is awesome. But is basing your effort off of how much you sweat the right way to do it? Probably not. Let’s talk science. Remember when I said everybody is different? When we take our temperature, 98.6*F is the number that comes to mind. With the onset of exercise, our bodies start to warm up! During prolonged exercise this temperature may go up to 100*F, but how do we keep ourselves from overheating?! Our body has several mechanisms which help to regulate our temperature. One of them is sweating. The amount of fluid lost during a bout of exercise. The average person sweats between 0.8 to 1.4 liters per hour while exercising. But that’s a fairly wide range! Everyone’s sweat rate is different and certain factors (i.e. hydration, temperature, and clothing) can influence your sweat rate, not just effort. Knowing your sweat rate is especially helpful for runners and endurance athletes! Finding that magic number is key to make sure you aren’t dehydrated, but don’t drink too much. Check out this article from Runner’s World about calculating sweat rate. Have you heard of these? Typically a piece of neoprene that wraps around your abdomen and is worn while exercising. The intention behind these is that if you sweat more around your abs, you will burn the fat in that area. Your midsection is going to become hot and try to dissipate that heat through sweat; however, the weight lost is water weight. After your workout, that will be replenished as you hydrate your body with water and the weight comes right back. Remember, sweating more does not mean your body is expending more calories. If your body is overheated, it may actually inhibit your exercise performance and you end up burning fewer calories. Limited range of motion can also be a factor that changes how effectively you are performing certain exercises. It is not possible to spot-reduce the weight from just your midsection. 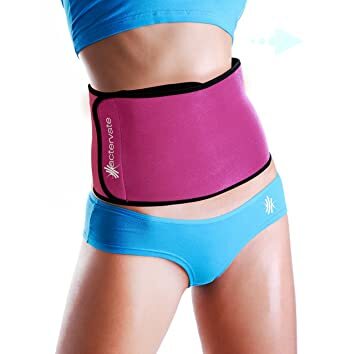 By wearing a sweat belt, you are not targeting the fat around your stomach. I am so excited to share with you our first recipe of the week. My coworker first shared this recipe with me last year and I have been in love ever since. This is a recipe from Moosewood Restaurant Favorites and it is sure to be an excellent addition to your recipe collection. Preheat oven to 425*F. Lightly oil two rimmed backing sheets. Roast for about 15 minutes. Stir and return to oven. Check time again in about 15 minutes. When all vegetables are tender, remove from oven. Our first Wednesday since going live is here and this is the first of many workouts to come. There will be something for everyone as we will include home routines, gym routines, running workouts, and stretching regimens. This week we are kicking off with a stairmill routine! If you have never used one, it is literally a revolving staircase that allows you to achieve an excellent lower body workout and tax your cardiovascular system. While this piece of equipment can be terrifying, once you become accustomed, it will likely become one of your favorites. One of my worst gym fears is falling off the back of this bad boy but I am happy to report I have not experienced that after years of use. It mimics a real life activity. Everyone has to climb stairs at some point! Works your entire lower body. You will feel this is your quadriceps, hamstrings, glutes, and calves. Heart rate will increase within the first minute. You can achieve a fantastic caloric burn and sweat session on this piece of equipment in a little amount of time. It is lower impact than other exercises. As long as you are using good form, there will be less impact on your joints while achieving the same benefits as other exercises. Time passes by quickly. Since there are a variety of positions that you can do the minutes seem to tick by at a faster pace. Be smart. Know your limits and start at the appropriate speed for you. These speeds are only recommendations and you can start at whatever level is appropriate for you. Light grip on the handrails. It is completely fine to use the handrails for balance, but no death grips!!! If your fingers turn white, it’s a dead giveaway that you are gripping for your life. Reduce the speed so you can have a light grip. Upright posture. You want to avoid supporting your weight with your arms. Please do not bend over and lean on the front of it. We already spend so much time bent over our desks, in the car, on the couch that this is the perfect time to work all of our postural muscles. Press through your heels. Focusing on pressing up through your heels will allow greater glute activation. We often climb stairs on the balls of our feet which loads our quadriceps more and can result in knee pain. You will notice a tremendous difference if you focus on squeezing your glutes with each step. Here is our routine! Let us know how you like it. The speed in parenthesis is a recommendation based upon a stairmill with levels from 1-20. The “R side step” and “L side step” is done with your body and feet turned at a 45 degree angle in either direction and stepping over maintaining that form. This will engage your inner and outer thighs more than in the regular forward direction. The “skip a step” is meant for more advanced individuals and is completed by waiting until a step passes to continue. If you have any knee issues or if you are new to the machine, just perform one minute at fast pace! Repeat this workout 1-3 times for a sweat dripping workout! Another Tuesday, another adventure! Today I traveled to Hempstead Lake State Park. Nestled between Peninsula Blvd and the Southern State Parkway is this sweet park with picnic tables, a playground, and a trail surrounding the lake. I decided to adventure around here to get away from the traffic while I ran. There’s a 3 mile loop around the biggest area of the lake. This trail is not paved and was a bit muddy from yesterday’s rain- but I was the only person out there on this chilly, spring day. Be aware that the path is a bit uneven and may have recently been walked by the local equestrian center (I looked down for most of my run). But when I did look up, there was a beautiful view of the lake without a cloud in the sky. I took a page out of Pam’s book and did a jumping picture to celebrate my 9:07 average pace 🙂 I haven’t mastered it like she has, but I’ll practice. Do you guys have a “signature” race picture? Mine is biting my medal like the Olympic athletes! L: 8 Miles Deserve 8 Slices of Pizza, Right? Do you ladies enjoy your long runs? Honestly, I used to dread them. It seemed so far or too long to run. Week #5 of training for the AirBnB Brooklyn Half Marathon is coming to an end. I’ve seen so much progress and a change in my attitude, and I have grown to truly enjoy my Saturday adventures. I love knowing that I will have that time to myself! It’s important for me to conquer the miles, knowing each run is taking me closer to my goal. The best part of my long runs? Sharing my thoughts with you! Because let’s be honest… we’ve all complained about the weather and tried to calculate how much pizza we can eat when we are done running! Let’s just keep running straight… until we run out of road! Laser tag tonight is going to be so fun! I’ve never played before… maybe beginner’s luck is on my side. Sweatshirt was such a bad choice. Sooo sweaty! Only 2 miles?! Woof… but look at my pace! How fabulous do I look with this hoodie tied around my waist? *Checks window reflection* Oh. I’ve definitely looked better. Who runs like that? Aaaand we are back on the road. Stay focused- What will I eat when I get home? Time to pick up the pace! Run, Forrest, run! Oh another track. It’s a trap!! Must. Keep. Running. Cool downs are such a tease!